Black teardrop keepsake urn is a reflective metal engraved inner teardrop urn with the engraving of black enamel covered completely. 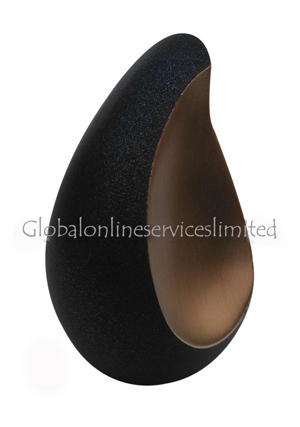 The black truro teardrop keepsake urn for ashes is made of quality brass metal and designed by professionally skilled artisans with a sand casting finish for a smooth sensation to preserve ashes in keepsake teardrop ashes urn. The keepsake memorial urn is engraved with a screw threaded lid opening from the bottom and has a grip to hold the lid for opening. The keepsake cremation urn holds 5 cubic inches of loved ones ashes. 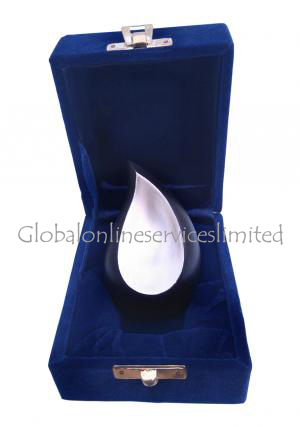 The teardrop keepsake urn 3.14 inches in height, length and width of 1.96 inch, weighs 0.24 kg approximately.